Summary: Madeleine is trapped—by her family’s expectations, by her controlling husband, and by her own fears—in an unhappy marriage and a life she never wanted. From the outside, it looks like she has everything, but on the inside, she fears she has nothing that matters. 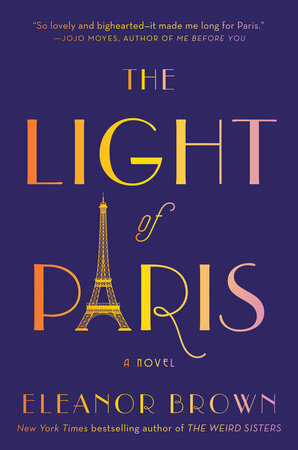 I was happy to see that Eleanor Brown has a new novel out called THE LIGHT OF PARIS. I really enjoyed her first novel THE WEIRD SISTERS -- you can read my review here; and I definitely wasn't alone. This book had some impressive critical and commercial success, and I just knew that Ms. Brown had some serious writing talent! THE LIGHT OF PARIS is another great story about a woman named Madeleine who is extremely unhappy with her life. She loved painting as a girl and young woman; however, she gave it all up when she got married. She's been living an unfilled life, always trying to please her controlling husband; and it seems to Madeleine like she's always been trying to please others and meet their high expectations of her. Madeleine decides that she needs a break from her husband, so she heads home to visit her mother -- not exactly the most welcoming place. She ends up finding a journal that her grandmother Margie wrote in her youth when she was trying to find herself. Madeleine always thought that her grandmother epitomized everything Madeleine desired to be; however, she learns that Margie was also an artist with dreams. As Madeleine reads her grandmother's words, she discovers that she took a trip to Paris during the Jazz Age and even fell in love with a French artist! Madeleine is intrigued with Margie's past and actually becomes inspired by her time in Paris. She uses the lessons from her grandmother's words to create a new life for herself. She returns to painting, makes new friends, and even finds a man who truly cares about her and wants to take care of her. In the process, she also learns some valuable things about herself as well as how to treasure what's really important in her life. I really enjoyed THE LIGHT OF PARIS. It's a set of coming-of-age stories (and you know how I love those!) that ties together two generations of women. I found both Madeleine's and Margie's stories to be equally compelling, and I thought the author did a wonderful job of showing how these women's lives followed similar paths. I especially found Madeleine's story to be touching. I loved how she rediscovered herself and found some happiness! Another special thing about THE LIGHT OF PARIS was how the author chose to tell the story. She wrote the book in alternating chapters between Madeleine's voice and excerpts from Margie's diary. I loved how their stories blended together, and I thought Ms. Brown really captured the essence of both characters through her storytelling. Madeleine, in particular, had a great voice. While she was definitely hurting and disappointed with how her life was playing out, she still had a great sense of humor. I loved some of her insights into life as well as her comments about her mother and husband. And finally, I appreciated so many of the messages that I found while reading this novel. Naturally, I enjoyed how both women found their way and made some very difficult choices; however, I also liked that this novel focused on the importance of the arts and creativity. I loved how Madeleine rediscovered her passions, including painting and food, and how she was able to take the brave steps necessary to start her life all over again. I found this story to be touching but also inspiring! I do think THE LIGHT OF PARIS would make an excellent book club selection. There is a reading guide available with eleven questions. Some of the topics that you might want to discuss include family, love, marriage, art, passion, Paris, mother/child relationships, independence, second chances, and more! I can honestly say that there is no lack of items to discuss about both Madeleine's and Margie's lives. I definitely recommend THE LIGHT OF PARIS to fans of women's fiction as well as those readers who enjoy stories about self-discovery. I loved The Weird Sisters too so I'm really looking forward to this book. It looks like I'm in for a treat. I just added this to my Good Reads list!